The weather feed is just one example of the kind of dynamic data you can add to your InfoVue screens with RSS, Media RSS, XML, and even social media feeds like Twitter and Facebook. 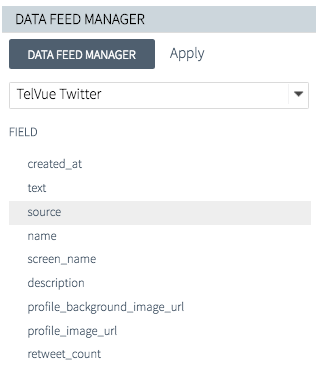 Before we get into some of the other types of Feeds you can display with InfoVue, let’s take a moment to understand the Data Feed Manager. To use an existing Data Feed, choose one from the pulldown menu, and drag one or more data fields across to the template or ticker staging area. To create a new Data Feed, click on the darker Data Feed Manager button. There are several feed options, including RSS, Server Feed, and social media options. To help you understand how to use these different reeds, we are going to use a different one in each of the next three design examples.